This is an extensive itinerary based on a number of recent research trips in the country, meeting with local artists, using superior hotels and including some new UNESCO World Heritage Sites as well as off the beaten track places which are of great cultural and historical value. 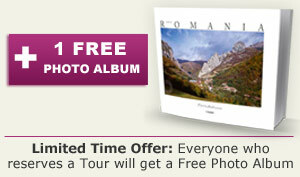 It is a tour which will take thru all the important historical areas of Romania, pointing out their own identity. The many cultural connections and exclusive visits are meant as a window into the Romanian culture and civilization, with old and new. The tour is further customizable. Early morning departure for the Black Sea Coast to Constanta, the largest sea port on the Black Sea. A city of over 350,000 population, Constanta was established in the 4th century BC as a Greek colony. The drive from Bucharest will take approximately three hours, crossing the Danube into the region of Dobrogea and driving along the (in)famous Danube-Black Sea Canal. The city tour of Constanta will take you to the Secession style Casino and the Genoese Lighthouse. Later tour the Archeology Section featuring the fabulous Glykon Serpent and the wonderfully restored the Roman Mosaic – one of the largest in this part of Europe. In the afternoon drive to Mamaia – Romania’s largest sea resort, established by King Charles of Romania in the second half of the 19th century and then continue north to the ruins of the ancient town of Histria (formerly the main Greek Colony on the Coast but silted by the alluvuim of the Delta). In the ealry evening arrive to Tulcea located right at the entrance to the Danube Delta. Hotel check in. Dinner on your own. Hot and cold buffet breakfast at hotel. This morning, you’ll explore the youngest territory in the world. (The Danube Delta started to form just 10,000 years ago and is still in the process of formation). On your exclusively charter boat you’ll have the chance to admire its scenic beauty and wildlife – it is known as the birdwatchers paradise, try your hand at fishing, or simply relax while browsing through the narrow channels. The Delta cuisine is certain to provide an interesting dining experience! 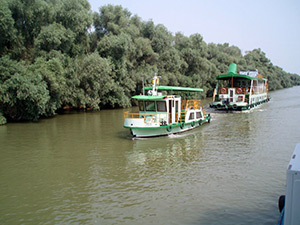 After breakfast, embark a small ship for a four to five hour private cruise into the Danube Delta. The tour will be led by a specialiSt tour guide and skipper. Start your cruise on the Tulcea Canal then off to Nebunu Lake through narrow canals. A great opportunity for bird watching and to admire nature. Lunch is served on board ship. Return to Tulcea around 1:00 pm. Disembark. Depart to Piatra Neamt crossing the Danube on the ferry at Braila. Arrive to Piatra Neamt; short orientation tour followed by check in. Dinner on own. Hot and cold buffet breakfast at hotel. After breakfast drive to the splendid region of Bucovina, the land of the outside painted monasteries, all of the part of the UNESCOheritage2 World Heritage. 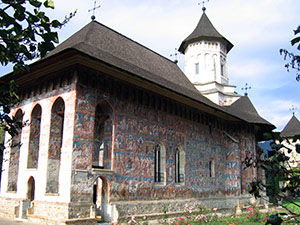 Bucovina monasteries are gems of medieval Moldavian architecture and artistry. Each of them has a predominant color. Start your day with Voronet Monastery, the most famous out of all, known as the Sistine Chapel of the East. Voronet features one the best Last Judgment fresco in this part of the World. Receive a complete explanation of the fresco. Next is Moldovita, Moldovita where the UNESCO Golden Apple Award given to the painted churches back in 1975, is kept. On the south facade of Moldovita is The Siege of Constantinople belonging to the 24 episodes of the Hymn to the Holy Virgin. Enjoy a traditional Bucovina lunch in the picturesque village of Sucevita. Drive to the nearby Sucevita, which is the largest of all, looking more like a mighty fortress than a monastery. The Ladder of John of Sinai is considered one of the best of the frescoes of Sucevita, rarely present in medieval Romanian art. In the village of Marginea visit the black pottery workshop – they use a technique called “oxygen reduction”, there is the same technique in Mexico only! End your day with Humor Monastery, the only one without a tower as it was not built by a ruling prince. Dinner on your own. A la carte breakfast at hotel. Drive west towards the splendid region of Maramures (northern Transylvania). Due to the relative isolation of their land, the people of Maramures developed a particularly strong community, with a unique personality, traditions, culture, fashion and lifestyle unspoiled for centuries. It is like a trip back in time. Admire the wonderfully carved wooden gates along Iza Valley including an original 235 year old household in the village of Dragomiresti. Visit the church of Ieud (UNESCO World Heritage Site). As a cultural connection, stop in the village of Rozavlea for a visit to the workshop of a famous master carver. He represented Romania in the 1999 Smithsonian World Festival in Washington, DC. 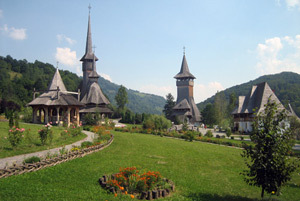 Visit Ieud Wooden Church. Depending on the day of the week visit a local animal market. 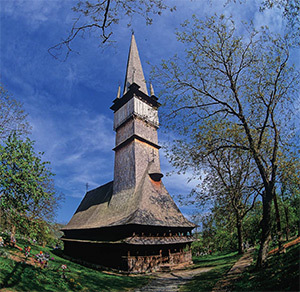 The tour will include Barsana Monastery, a great example of Maramures wooden church architecture. In the afternoon reach the village of Iza on Iza Valley. This will be our base for the next two days. Accommodation in a private house in the village. A home hosted dinner (and plum brandy) is included so that people get deeper into the local culture. Our hosts will join for dinner so this will a cultural interchange. 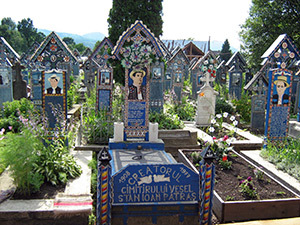 The worldwide fame of Sapanta is due to the unique cemetery that has become an important tourist attraction. The original character of the cemetery is first of all suggested by its name: Cimitirul Vesel that means The Merry Cemetery. 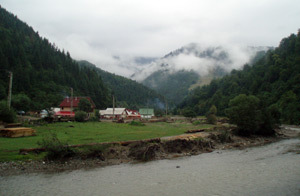 After breakfast, take an exclusively designed walking tour of the village of Iza including an icon-on-glass workshop (and learn about the technique), an ancient tyoe plum brandy distillery still used by the lcoal community to make the doubls distilled plum brandy as well as a typical whirlpool using the Iza River water. Enter the heritage3new Orthodox church of the village which will be in the process of getting painted in fresco. Drive to Sighet and, as a cultural connection, mingle with the locals in the twons’market. Then tour the Anti Communist Memorial – a political prison in the Communist times. This is one of the main memorial sites of the continent, alongside Auschwitz Museum and the Peace Memorial in Normandy. The visit here provides a direct connection to Romania’s most recent history. Optional visit to the house of Nobel Prize winner, Elie Wiesel. View of the famous Tisa bridge is included. Continue west along Tisa River (very close to the Ukrainian border) and reach the village of Sapinta world famous for its “Merry Cemetery“. Here each wooden cross carries a funny epitaph about the person’s life. Late in the afternoon return to Iza for dinner and accommodation. Following breakfast, you’ll be driven to the magnificent wooden church of Surdesti built in the early 1702 and until recently the tallest wooden church of Europe (UNESCO Site). Continue south to Sibiu via Cluj Napoca – the largest city of Transylvania, a wonderful centuries-old town where you’ll visit the Ethnographical Museum. Brief stop at Alba Iulia, famous for its Vauban style citadel. The destination is Sibiu, formerly the chief cities of the Transylvanian Saxons. Its well-preserved old town is dating from the Middle Ages. 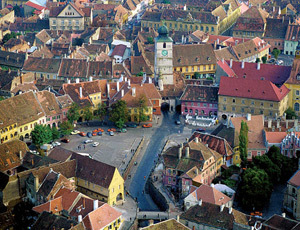 In 2007, Sibiu was declared the Cultural Capital of Europe and underwent wonderful architectural restoration. The Historicl Center is on the World Heritage Pending List. Take an orientation tour on the way to the hotel including the old belts of fortifications and guild towers. Hotel check in and dinner on your own. Suggested is Crama Sibiul Vechi, probably the best restaurant in town serving all traditional Transylvanian fares. Hotel Imparatul Romanilor, located in the old part of Sibiu near the main square, in a 16th century building built in traditional Transylvanian Renaissance style, a former merchant’s hall transformed into hotel in the 18th century, with many famous guests: Emperor Franz Joseph II, composers Franz Liszt, Johann Strauss Jr., as well as Prince Charles and many others. Hot buffet breakfast at hotel. Start your day with a leisurely walking tour of Sibiu, the chief city of the Transylvanian Germans. The Old Centre is awaiting recognition by UNESCO. Visit the old surrounding defense walls and the remaining guild towers. One of the landmarks of Sibiu is the Bruckenthal Museum assembled by Baron Bruckenthal, governor of Transylvania at the beginning of the 19th century, the second ever art museum to openin Europe. Its core art collection used to belong to the Baron. The Evangelical Cathedral was completed in its actual shape in 1520, but inside, there is an exquisite fresco of the Crucifixion on the north wall of the choir dating from 1445. Visit the Passage of Stairs linking the Upper town to the Lower town, the 1859 Liar’s Bridge and the Byzantine style Orthodox Cathedral, a replica of St. Sophia in Constantinople. Do not miss the original Pharmacy Museum. In the afternoon, you’ll venture to Biertan Fortress Church, a World Cultural Heritage site that hosts the largest wing altar in Romania and was used for more than 300 years as the official residence of many Transylvanian Lutheran Bishops. Upon your arrival in Sighisoara, you’ll understand why it is considered to be the best preserved medieval town in all of Europe. Continuously inhabited since the early Middle Ages, Sighisoara is the birth town of Prince Vlad Dracula! Dinner on own. Hot buffet breakfast at hotel. Before starting your walking tour of old Sighisoara attend a lecture on Vlad the Impaler –Dracula, what is truth and what is fiction. Sighisoara is one of a kind. A World Heritage Site, this is the only still inhabited medieval citadel in Europe. It was developed by the German settlers as of late 12 C. It stands on a network of tunnels and catacombs and, according to one version of the myth; this is where the Pied Piper brought the children of Hamelin after their ungrateful parents refused to pay him his due. Walking tour includes the two squares of the Citadel (Upper Town), the Scholars’ Staircase, the Ducklings’ Square, the Tinsmiths’ Tower, the House with Antler, the Tower with Clock (climb up for a great view), the Torture Chamber and the Weapon Museum. 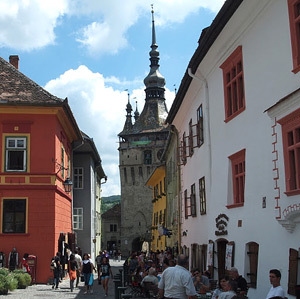 Sighisoara is the place where the famous Vlad the Impaler Dracula was born in 1431. Journey south to Brasov for a tour of another beautifully unique city. You’ll have a busy afternoon with visits to St. Nicolae church, the Museum of the first Romanian school in Transylvania, and the magnificent Black Church – largest Gothic style church in South-Eastern Europe and featuring a collection of over one hundred 17th century Muslim prayer rugs. Hotel check in. 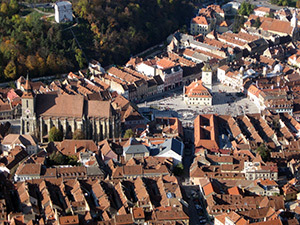 Enjoy th pedestrian area of Old Brasov with its many restaurants and outdoor cafes. Hot and cold buffet breakfast at hotel. Morning cable car ride on top of Tampa Mountain offering a great panoramic view of the city. Visit the Weavers’ Bastion – one the well preserved medieval guild fortresses. 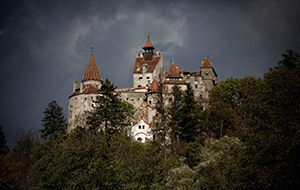 Later, it is time for Bran Castle also known as Dracula Castle and one of the major attractions of the country. The castle was built in 1377 to safeguard the trading route between Transylvania and Wallachia, enlarged and restored a few times since then. A guided visit of the castle is included. Drive through Predeal, Romania highest town. Late afternoon arrival to Sinaia mountain resort. 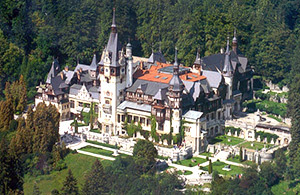 Named after St. Catherine’s Monastery on Mount Sinai, Sinaia became the unofficial capital of the Kingdom of Romania towards the end of the 19th century. Orientation tour of the resort including the famous Casino, inspired by the one in Monte Carlo. Once the famous Orient Express train use to regularly call here and it still does once a year on its way from Paris to Constantinople. Hot and cold buffet breakfast at hotel. In the morning, your first stop is the Peles Castle and Gardens, the awesome former summer residence of the Romanian royal family, built in German Renaissance style and known as one of the most beautiful summer residences of Europe. From there, you’re off to the Sinaia Monastery, a beautiful example of the Wallachian – Byzantine architectural style and the first building in Sinaia. Drive to the Coanda International Airport in Bucharest for your return flight OR take our BULGARIA EXTENSION. 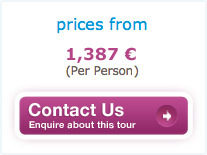 Extra Night in Bucharest: 39 Euro per person with breakfast, VAT and city tax. Airport Transfer on arrival: 30 Euro per ride (includes pick up with name sign). 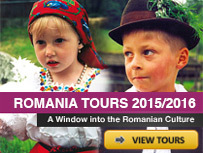 Bucharest City Tour: 38 Euro per person (includes hotel pick up and drop off). Hi Oty, Now I am getting beck to you late. Our tour was wonderful. We never would have been able to see half of what we saw if we hadn’t gotten a guide. Doru was great. He waited patiently for us at the airport even though he did not know that our plans had changed at the last minute and we were not only coming in on a later flight, but from a differnt city. ( Our first flight out of Burlington, Vermont to Chicago was selayed several hours because of mechanical problems. Our flight to Frankfurt had left Chicago before we ever left Burlington. All the later flights to Frankfurt were over booked.) Thankfully Doru waited. He explained everything to us along the way and answered all our questions. Dore was not only very professional, he was very concerned that we were comfortable and satisfied with what was planned for us. In small towns he checked to see what other craft people might be available for us to visit. In addition to what was on our itinerary we visited a weaver in Sapanta, who very graceously invited us into her house after she demonstrated her weaving. We also visited Domna Pipash who shared her lace and embroidery collections as well as her art. She also took us into her home to see some of her and her husband’s other collections. We also saw a museum and war memorial that was not on our ininerary. Doru also explained about some of the customs, funerals, weddings, etc. There is no way we would have covered the miles , or found the crafts people, or understood any of the culture if we had not had a guide. The accommodations were very good also. The place we found, Grandma’s House was charming, which is what we are used to when we travel. The family stay in Maramures with Ioan and Sylvia was extremely comfortable. They were very accommodating and even packed a lunch for us on the day we left. I wish they would have spent a little more time with us, perhaps eating with us. Hilde’s was very very nice and more luxurious than we are used to. It is really like a 4 star hotel – very comfortable. In Sinaia the Economat was very good for us. The location was perfect since we were on a time schedule. It was very clean, comfortable and had a lot of character. We also enjoyed the food. There was a lot of variety. Our favorites were stuffed cabbage rolls and for desert papanash (?) won the prize, hands down!! We are addicted!! !